What is the mission of Greater Brandon Meals on Wheels? Our mission is to provide nourishing mid-day meals from Monday to Friday to enrich the independent lives of homebound residents of Brandon. How is the mission accomplished? 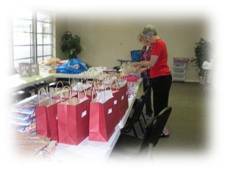 Meals on Wheels volunteers prepare and deliver nutritious meals to qualified home-bound clients through the coordination of member churches in the community. Who is eligible to receive a meal from Greater Brandon Meals on Wheels? A home-bound person who is unable to prepare a home-cooked meal. This can be a temporary or permanent situation. Through established guidelines, clients are screened in their homes to verify need. What area is included in this service? The Brandon, Florida area: boundaries to East-Dover Road, West - I-75, North - I - 4, South - Alafia River. When is delivery made? Meals are delivered between 11 am and 1 pm Monday through Friday. What is a typical meal? The typical meal consists of an entrée, a vegetable, a starch, a salad and a dessert. Each church has the responsibility of providing the specific menu for the day. How is Meals on Wheels funded? No government funding is received. All funds come from contributions from recipients for their meals supplemented by the generosity of individual donors and businesses who believe the program is an asset to our community.